Does your vehicle have a scratch? Is the estimate to get it repaired just too high? 3M’s Scratch Removal System is exactly what you need! The 3M Scratch Removal System is a professional grade spot repair kit designed to eliminate scratches, swirls, and etching from clear coats. Even if you’re not a pro, you’ll get professional quality results with 3M’s easy-to-use, high performance scratch remover kit. The 3M Scratch Removal System works with a household drill to restore paint to perfection. It’s quick, easy, and it’s much cheaper than a professional repair job. The results are just as good. 3M makes the products used by professional paint repair technicians so it’s no wonder that their DIY Scratch Removal System gives you professional results. View the video below to see how easy it is to remove clear coat scratches yourself using a common household drill. Read more about the 3M Scratch Removal System at Autogeek.net. Have a repair or repainting project coming up? The 3M Random Orbital 6 Inch Air Sander is the perfect tool to correct auto paint using 3M’s 6 inch sanding and finishing discs. This lightweight, dual action palm sander moves in two distinct oval patterns so no abrasive particle follows the same path twice. Therefore it’s easier to get a uniform finish over the entire work area. The 3M Random Orbital 6 Inch Air Sander works with an air compressor. The 6 inch disc pad is ideal for sanding large body panels or entire vehicles efficiently and with uniform results. The 3M Random Orbital 6 Inch Air Sander is under 2 lbs. and has a rounded grip to reduce hand fatigue over long periods of use. The 3M Random Orbital 6 Inch Air Sander has a 3/16 inch orbit, which is rated for general purpose sanding. A Stikit Low Profile Disc Pad is included with the sander. Check out our selection of 3M sanding and finishing discs for more disc options. To learn more about the 3M Random Orbital 6 Inch Air Sander and 3M’s paint refinishing products, visit Autogeek.net. 'Tis the season for saving on 3M products! 3M has just released several excellent mail-in rebate offers just in time for summer! Each offer requires that you print out the rebate form and mail it in to the given address with your proof of purchase. 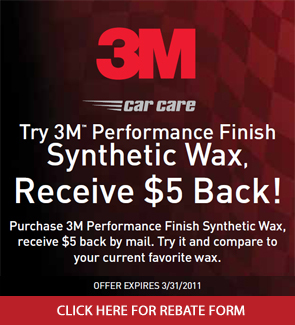 Save $2, $3 or $5 on outstanding 3M car care products! For all the details, follow the links below. Click here to buy the 3M Headlight Lens Restoration Kit. Click here to buy 3M Performance Finish Synthetic Wax. Click here to buy 3M One Step Cleaner Wax and 3M Tire Restorer.